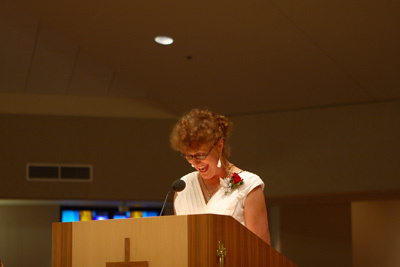 Reverend Karen Chenoweth was born in Columbus, Ohio, USA. 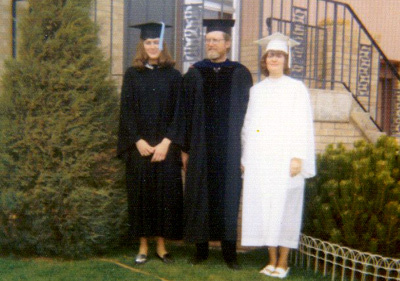 From four years of age she grew up in Laramie Wyoming. 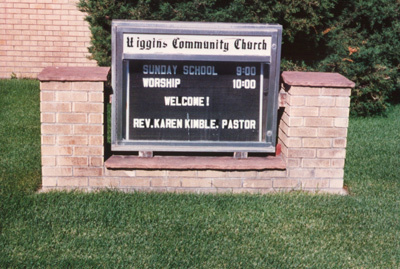 In 1984, Karen was ordained a Church Minister in Greeley, Colorado, USA at the first Congregational United Church of Christ. 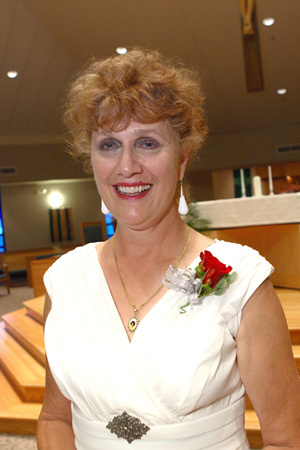 In her ministry work, Karen has served as a parish minister, a university minister and a hospital chaplain. 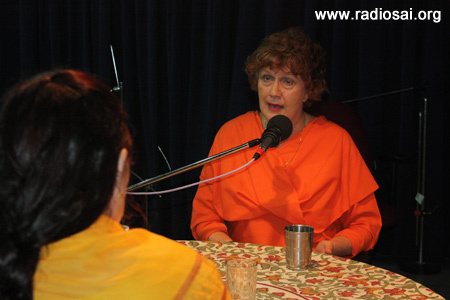 While serving the church as a minister, Reverend Karen Chenoweth had the profound spiritual realisation that the second coming that the scriptures speak of had already occurred and that it was staring her in the face as love, as truth and as bliss in the person of His Divine Worship, Bhagawan Sri Sathya Sai Baba. This startling truth and this open declaration cost Reverend Karen Chenoweth her job at the Church. She performed her last duties as a minister at the First Congregational Church in Wheatland, Wyoming, USA on the Sunday after Easter in 2004. Today, she is no longer associated directly with the Church but her love for Christ continues to inspire her to serve others. As a counsellor she teaches self-help classes for women and various groups. Currently she works as a Reiki master to assist the healing process in both people and animals. She also composes music and sacred lyrics and is a poet having written the book, “Soul Fire Soul Desire”. 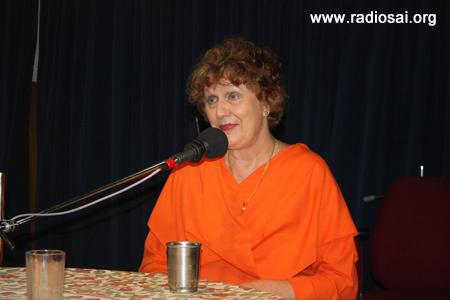 Radio Sai (R.S): Sai Ram Rev. 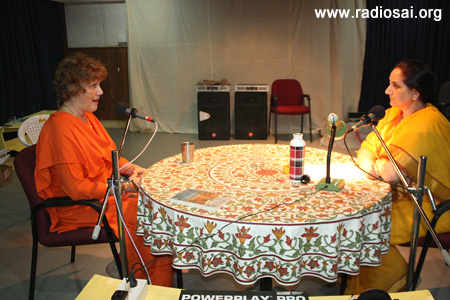 Karen Chenoweth and welcome to Radio Sai! Rev. K. Chenoweth (K.C): Sai Ram! I am very pleased to be here and I would like to directly give my love and thanks to our dear Lord, Swami Sai Baba and, of course, to Radio Sai for having me here. R.S: Well let us start off with a quick recap of the cultural and spiritual background that you were born into. K.C: I am citizen of the United States of America. I grew up in this wonderful university town and from the very beginning the truth was very important to me. 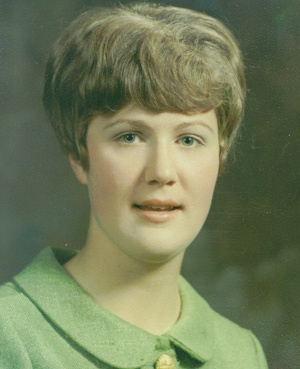 My parents were very active in the Presbyterian Church and it was the same with me too. I remember on youth Sunday if they ever wanted anybody to speak, I would raise my hand and say, “I would like to give the message for the day”. I taught Bible school, Sunday school, and I was president of our Church Group and it was just such an important way for me to express my love for God. I have to say I came into this life-time loving God immensely. The presence of God was the most real, concrete, tangible thing in my life. I think I’ve known the experience of bliss, it kind of popped in and out here and there ever since I was little. R.S: So it looks like your choice of your carrier as a Minister, was just a natural progression of your faith or your life experiences? K. C: It actually was. It was indeed my husband who said that I ought to go to the School of Theology. R.S: So you went to the School of Theology, after your marriage? K. C: Yes, and before that I had actually been trained in education to be a teacher. R.S: So from education you shifted to Theology? K. C: Yes, and, in a way, it was a very easy shift for me to make because the love and spirituality was already there and I was one of those people that loves to get up in front of people, like a teacher, and help the students grasp concepts. So it was very natural but it was difficult because when I started Seminary I had two small children and my second daughter was only three months old. I had to commute an hour each way, spend the whole day, come back, be a mother and a wife and it took me about five years to complete the course which is called the Masters of Divinity. 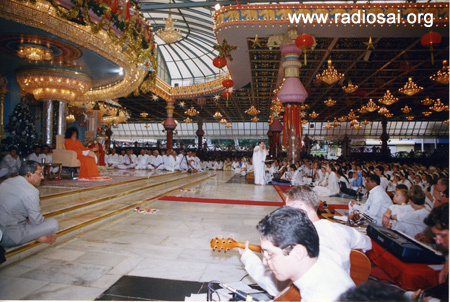 R.S: Rev., then when, why and how where you drawn to Bhagawan Sri Sathya Sai Baba? K. C: I was drawn to Swami actually in 1975. I was living in Greeley and there was a very lovely community which is probably sixty miles down the road. I had a friend there and one day she said that they were doing a spiritual programme at the community centre. She invited me to go with her and so I went. I saw there a video of Swami and I probably sat there with my mouth open the entire time because in my heart I went, “Oh my! Oh my! God’s back on the planet”. I mean there was absolutely no doubt in my mind that God was here in flesh and blood. R.S: Just seeing that one video you knew that? K. C: Yes, just seeing that one video I knew it. But I was quite young then and had two small children. Swami didn’t call me to come see His form until 1999. I suppose I needed to do my Dharma, my duty as a wife and a mother and be trained as a minister. 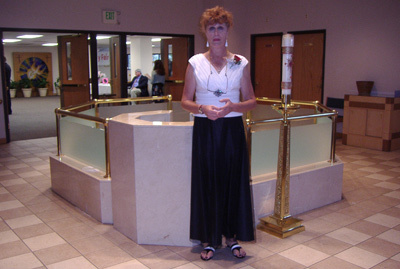 I sang in many choirs and toured different places in the world with my music. I had an opportunity to do all these things. R.S: So when you were ordained a minister you were already aware of Bhagawan’s presence on earth? K. C: Yes I was. R.S: But you had not met Him in person? K. C: No, I had not physically had the gift of darshan but what did happen was I started developing this amazing relationship way before I physically came to see Swami’s form. It was a continuation of my love for God. As a child my concept of God was actually formless; it was just Love and Caring, the message of Compassion. So it wasn’t really about a form. When I finally came to Puttaparthi for darshan it was absolutely perfect. It was December 1999 and I had the most fantastic time. I sang in the Christmas choir and was in the play based on the Wizard of Oz. Swami was very available physically then and He would come out during play practice. Once, when I was finished with my lines, He was sitting there and was quite close to the stage and I was right there at the base of the dais. Our eyes met and He just looked intently and I am not sure what had happened during that time but the bliss, the knowingness, the connection to all that is, was so strong that I said,” Oh! Thank you God’. I went back to my room, just collapsed on my bed and fell asleep. That was my first trip to India and I had come with a group of nine. Now the story doesn’t stop there. Before leaving for home after that visit we had double checked with the airlines that all nine of us were actually confirmed to be on the plane to go back to the United States. Everybody’s seat was confirmed so we got to the airport. There the authorities went through the list and said my name was not in there. So they didn’t let me on the plane and the rest of the group returned to the United States. 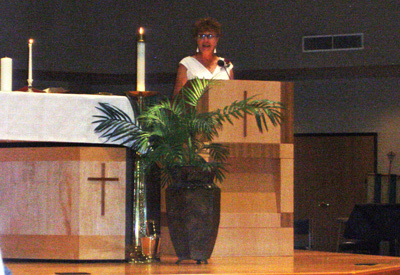 It was during that time that the congregation was deciding that I was not a fit person to be the minister. R.S: So, I guess, there was reason why you were being kept back here. K. C: I truly believe in my heart that Swami wanted me to stay back for some reason. R.S: How did Swami’s presence or knowing of His presence impact you as a person, or as a minister? K. C: The way it impacted me as a person was that I remember reading somewhere “Why fear when I am here” and I had a firm belief at that time that there really is no reason to fear anything. I knew God is actually here; the very God that I stand up in front of every Sunday is actually here. Also, it helped me very much with my job as a hospital Chaplain. It is not easy to do this job when people come in and there have been these horrendous accidents and you have to soothe the family and keep order and go back and forth between the doctor and the family. There was a gradual knowingness inside of me of God’s power and God’s strength that had always been there but started growing after I came in touch with Swami. Also, it started to make more sense of what Jesus had said. I began to understand what He meant when He said that first He was a messenger of God, then Son of God, and then finally He and His father were one. This understanding also was growing in me even though I had not been to Puttaparthi to see the form. I realised that first I am a servant and then I am the daughter and then there is no difference - God and I are one. R.S: How did that go with the Church? Were you able to articulate that feeling? K. C: I was able to express and that is why when I was finally asked to leave the Church, there were two things that were said. 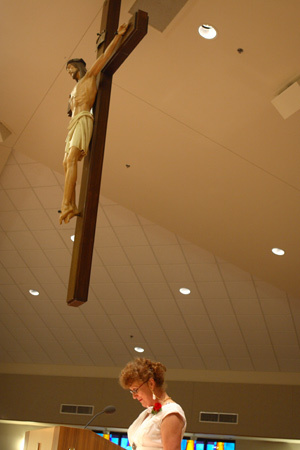 They said that even though they could not connect to me any more as a minister, because of where I had been and what I proclaimed to believe, what they did understand was my love for God. They said that regardless of what I said, that love just came through all the time and they respected and admired that. But, I must admit that after I came here to see Swami there were times when I felt a little bit of dissonance between by love for Jesus and now my love for this other form called Sai Baba. This I could resolve only with a lot of prayer. The way I could conceptualise it was that, for me, Swami has always been the One who sent Christ. He is God, the Creator and Jesus was the one that Swami sent as a Master, as a Great Prophet and Teacher who went through these steps that Swami talks about. The steps of first being the servant of God, then being the Son or Daughter of God and then to actually knowing or realising that I am that - I am God. Also, I found a very powerful book here called the “Teachings of Sai Baba and Jesus” and when I went through it I realised that they were saying the same thing. So, until I was fired from the Church, what I would do on a Sunday was while preparing my Sermon I would just kind of restate what Swami had said because that was what Jesus was saying because the truth is the same. But for me I think emotionally and personally that book helped me to see that there is only one God and that there is no difference between the various forms. I could still deeply love Jesus, which I do, and intensely have some amazing personal experiences of His awareness but, at the same time, it is such a blessing to be living at the time of the Poornavathar, Sri Sathya Sai Baba. It’s absolutely incredible. R.S: All right, so when you went back to your congregation after your first visit here, what did you tell them? K. C: That first time I told them I was on vacation in India… ha, ha… And then I waited for a year and I had vacation time again in December 2000. I could not wait to get back here to see the Lord’s form. I had basically got a month’s leave and so I came here and this was the first time that I physically talked to Sai Baba and also offered Him a letter and that was very interesting. In the letter I said, “Dear Lord, if you really want me to stay then You will receive the letter and that will tell me You really do not want me to go back with the group again” and, sure enough, in Whitefield I ended up in the first row. Swami came down. He actually went all the way over to the men and then made a special detour, coming down one of the exit aisles that I was sitting in. He stopped and took my letter and asked me questions like “How are you? Where are you from?” etc - you know those questions that he typically asks. I just melted away. I was gone in the bliss because for me that was He saying “Karen, I need you to stay a little bit longer”. So I did. I stayed for Shivaratri. Meanwhile I called the Church Secretary and said, “Oh, by the way, I need to extend my vacation a little bit longer. God has told me to stay here longer”. These were the words that came out of my mouth but I was sure that I did not intend to put it like that… and then there was this absolute dead silence at the other end of the line...ha, ha, ha….I hung up and said, “Oh! My God Swami, what I did I just say?” So I stayed for Shivaratri and that was beautiful because I did see the lingam coming out. When I finally reached back home I had actually been gone for five weeks instead of four. Then the board called me and gave me a letter saying I was no longer fit to be their minister and that they were going to start the proceedings to fire me. R.S: And did they give you their reasons for doing so? K. C: They thought that I had betrayed them by not coming back. They really wanted to know the truth of where I had been and why I had not come back earlier, so I told them. I said, “I know that God has reincarnated on the planet in the form of Sri Sathya Sai Baba. He lives in India. I believe this in my heart of hearts and the last two trips, I’ve been there to see Him. For some reason He asked me to extend my stay a little bit longer and that’s what I did”. Again you could have heard a pin drop, and after I made this comment they said, “Well Karen, that’s great but we still think that you are not fit to be our minister.” So I said, “It’s a long process to fire a minister and it is very painful for everybody involved so I will just go ahead and resign because you do not want me to be your minister. I will conduct services through Easter and then I will be happy to quit.” They agreed to that. Then they said something very surprising, but again, I know it was the Lord working, they said, “We want you to tell the entire Church what you just told us.” So I did. I got up on Sunday and I told them everything about Swami. I started up by explaining His teachings, the great social works that He has done, His care for the poor, how He has personally helped people that we will never hear about. I spoke about His Love and Compassion for all. I explained all of that to the congregation and again I saw people sitting there with their mouths open. It was dead silence. I finished the service and went to the end of the Church. I always shook people’s hands and these three beautiful older women came up and one of them said, “Karen, if the Lord had told me to stay I would have to”. I think that helped a little bit. It was a painful situation for me because I did love the people and I think there were many people who loved me. I had almost split the Church in half because of the situation. R.S: So when you gave your final speech or service, those parting words were powerful and obviously quite shocking to some of them; so how did the congregation react? Did you find people come up and talk to you later or did they nod their heads in disbelief and walk away from you? K. C: Some of the people came up and talked to me because they had always been very supportive of me and some of them shook their heads in disbelief, actually walked out of the door with their heads down and would not even look at me. Some of them came by shook my hand and said, “Thank you, I do really respect you but I agree you are not the right person for us”. They were completely taken back by what had happened and I think for the Christians I have met, God could have only incarnated once and that was Jesus Christ. That was the end of it. R.S: But then the scripture do speak of the second coming, do they not? How does the Church interpret that? K. C: I think the church interprets that in many ways. There are also Christians I feel who are waiting for the second coming and they believe that it is going to be a form like Jesus Christ and when He comes, He will sort of scoop up in His arms all those souls that had been faithful to God and particularly to Jesus and take them to some heaven. I think there is one quote in the Bible which whether it is really accurate or not is what a lot of Christians have as a stumbling block and that is that the only way to the Father is through Jesus and Jesus has been purported to have said that. So, even my family, who are Protestant and Catholic, really believe that Jesus is the only way to the Father. They are waiting thinking that it is going to happen in the very near future. Some people think it is going be a few thousand years away that Christ will return. Those who are more attuned with the metaphysical and with Swami’s teachings see Swami as the Cosmic Christ. They would use that term because Jesus was the name for the physical form, Christ is the term for the entirety of the Godhead, the Creator. For many people like me who have grown up as Christians and know about Sai Baba, it makes perfect sense and we can see Swami as the Cosmic Christ. I think there are some Christians who see Sai Baba as an anti-Christ or something. I mean I have run into them and they want to persecute people who say that God is on the planet again. R.S: How do you deal with those people? K. C: First of all I pray that Lord, let me not condemn or judge. Let me see that they are probably where they need to be in their spiritual beliefs and then I just listen to them. Then I ask if they want to hear my opinion or facts on this and if they refuse I just bless them. R.S: I guess that’s where your training as a minister comes in handy; you are able to accept this and let them be because that is their place in their own journey. Everybody is on their own spiritual journey and they are at a different place than you and the fact that you can still pray for them and bless them, I guess that’s an outcome of Theology College, and years of being a minister and loving Jesus. K. C: I think very much so. R.S: Well, seeing that you have come to this realization and risen over the past I just have to ask you this, when you were let go from the church, was it hard? K. C: Yes, that was hard. But I couldn’t have done it any other way because in one of the letters that Swami wrote to somebody, He said, “Enjoy every moment of your life, but have your priorities” and God is my priority. I have absolutely no regrets about this because I feel that the Lord wants me to do things. In fact He once said “I want you to teach people about God”. I’ve been working on that but I think within the confines of just a Christian denomination that can’t accept any path other than that of Jesus, it would be very difficult as I don’t have any official status outside of the Sai Baba centre. I haven’t had an official platform where I can just stand up and speak freely about the unity of our religions. The open mindedness is there but not in very many people; it’s very small. R.S: Rev. Karen, if you were to have an audience with His Holiness the Pope in Vatican today, what would you say to him? K. C: First of all I would thank him for being willing to be a spiritual leader to a very large Christian group of people, because that can be very difficult. There were always factions and there were always people who want to get rid of him, maybe people who don’t like what he says or who disagree with his policies. R.S: But the Pope’s tenure is for the life? K. C: Yes, right, but I believe that he still has to have discussions with his cardinals, question his faith, his belief in God…. R.S: So you would thank him for dealing with it? K. C: I would thank him for dealing with that first of all and then I would say, “If you have a few minutes may I speak my truth?” and I would just outright say that “This may be a little interesting to hear, but the God that you and I both worship has taken form again and is on the planet. A few men call him the Cosmic Christ.” What I’ve learnt in the last ten years is that I am going to speak my truth and I am going to tell people about Swami. R.S: Okay, now, if you had an opportunity to speak to Bhagawan Sri Sathya Sai Baba, have a quick audience with him, what would you say to Him? K. C: What would I say to him? Well, I did have that opportunity. K. C: I would call it an interview. I was sitting in darshan and Swami came around and pointed right at me. So I started talking to Him. I looked Him right in the eye and said, “Swami, I love you so much” and He looked back at me. He asked me some things like where I was from, how long I would be staying, etc. But for me nothing else mattered. Just expressing my love to Him was the most important thing for me. I had said to Him all those years that “Swami, if I get an opportunity to be with Your physical form, I just want to look in Your eyes and say Swami, I love you” and that’s what I did. Then His hand whipped up like this and I was so close, I could see gold beads coming out of His hand. He caught them and asked me to put my hand out. I did and he put it in my hand and said, “Put on” and then He said, “Pendant” because I had previously bought a pendant of Him. I could not believe what had happened and was shaking like a leaf. I said, “Dear lord, I am shaking so hard I can’t do this” and He laughed and He smiled, and looked at me and said, “Oh, go… sit down”. R.S: So He gave you… was it a japamala or a chain? K. C: He gave me this gold chain. R.S: Because you had bought the pendant and He was concerned that you did not have a chain to hang it on? K. C: Yes. It was amazing because never in a million years, would I have ever said, “Swami, I want something from You”. It had always been “What can I do for You and how can I be worthy of Your love?” And so when that happened it was just amazing. R.S: So, did it feel like an affirmation of your spiritual yearnings since your childhood and that they all came together in that one moment? K. C: Yes, yes, it was like “Oh my god! I could die right here on this spot”. R.S: And you would be headed to the pearly gates? 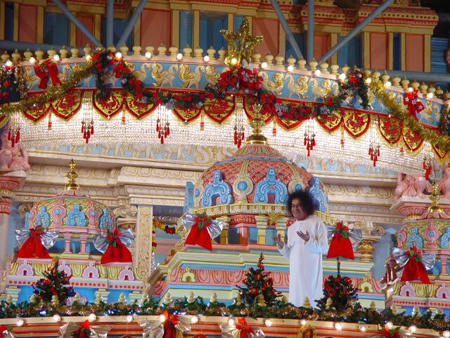 K. C: I would be headed for the pearly gates or whatever because I have to tell you that once when I came I looked at Swami one day in the darshan hall and said, “Lord, this is what I really want. I want to be completely self-realised in this life time, I want to merge in you. I need You whatever it takes”. There is nothing more important to me. If you ask me what Bhagawan Sri Sathya Sai Baba means to me I would answer that He is absolutely everything to me, my breath, my life, my motivation, He is what I live for and it has been an amazing journey. I would like to say to the audience that if they are not on a spiritual path then they should find one because our work, our relationships, money, etc. - all these things are important to take care of the body but there is absolutely nothing that compares to bliss which is peace, joy, and happiness. Also it is not enough to know God only intellectually. Having a personal relationship with Him is also important and I have a very deep and strong personal relationship with the form and the formless. R.S: Thank you for those very profound thoughts, Reverend Karen Chenoweth. It has been a pleasure to have had you here and very enlightening to listen to you. K. C: Thank you very much and again my love and thanks to Radio Sai and of course to our dear Lord. Sai Ram!